Even though we are a school of only ~2000 students, we still have three separate divisions. Our middle and high school are (literally) on top of each other but our elementary school is a separate building. Our middle school counselor has created a Buddy Program to help the grade 5 students transition from elementary to middle school. Each Grade 5 student is paired with a grade 6 “Buddy.” I think this is a great idea so when she approached me to help her brainstorm ways for the students to be in touch over the summer, I was all-in! 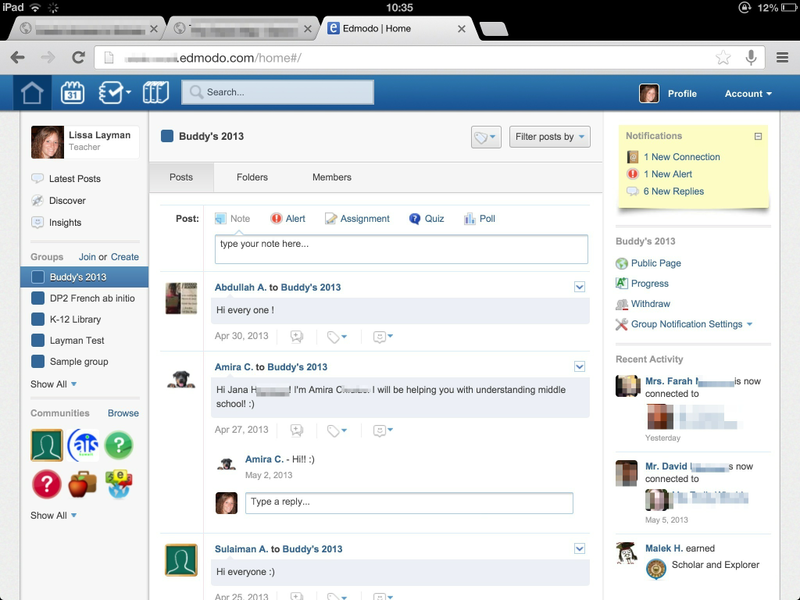 Our middle and high schools started using Edmodo this year. We have our own school domain and many teachers have been effectively using it to communicate with their students. Since the grade 5 students will need an Edmodo account for next year, we decided that it would be better to use a platform that they will need next year instead of having them sign up for something they will only use once. The counselor set up an Edmodo group and gave the group code to the grade 6 students (who immediately started posting, welcoming their buddies). Over the summer, she will monitor the group to make sure that students are being kind and respectful to each other. Note: I did not receive any compensation for this review. Just my honest opinion & experience.